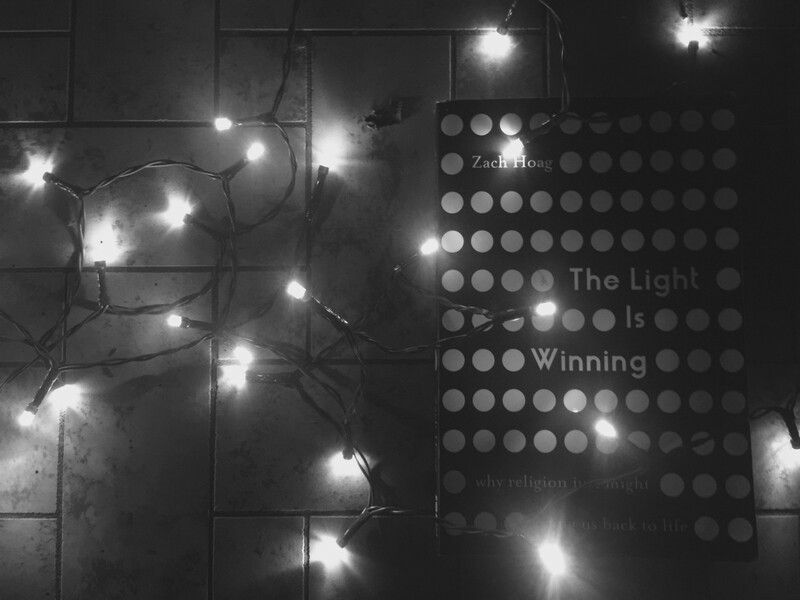 “All right, convince me” — me upon opening Zach Hoag’s book “The Light is Winning” for the first time. TLIW is Zach’s personal story, wrapped up in the story of the church. He speaks of the verging “Apocalypse” of American church culture but he does so with real hope. I’ll admit I’m a hard sell. I’ve been to a ministry school and served on a church staff for three years. I’ve seen behind the scenes and while the people are wonderful the system is broken. Then here comes Zach with this bold book talking about how there is hope for the church and hope for the people of Jesus to say something meaningful in these dark times. And there’s no denying that these are dark times. We are in the midst of culture wars, of partisan hatred, and an ever-growing no-man’s-land between the trenches of family, community, and Church relationships. In the midst of the chaos of the secular world the church is buckling under the weight of it all. Put frankly, the church is experiencing an apocalypse. No, not the “fire from heaven” kind we have heard preached before, as Zach explains. Rather it is unveiling — of truth, of purpose, and direction. The difficulty the church is experiencing now is a glimpse of the direction we are going. But this is the direction of great hope — and this is where Zach comes in. To say he’s seen it all would be an understatement. In his book Zach weaves a story, from his childhood in a fundamentalist cult, into his brief foray into Calvinistic thought, and his rocky church plant attempt. Zach has tasted failure. He has seen the apocalypse, but he has not lost hope. The story Zach tells is heartbreaking. If you’ve been hurt by church or become burned out, the experiences Zach speaks of will be all too familiar. Yet despite all that, this man hangs on to redemption. His own faith is not merely resuscitated, it is resurrected. And this right here is why I think this book is so important. There’s a lot of talk in the christianosphere about the “nones and the dones” — those who have left the church for greener pastures, or have burnt out on the demands of ministry, or simply those who have opted for a more mature faith. If you belong to this group, you know who you are. It is to this group that so much of this book is written. Zach avoids the back-to-the-pew rhetoric that I see from some pastors’ books and blogs. I admit I get nervous when I see pastors too quickly push those who are in a season of deconstruction to jump back into the church, or to feel a duty to the church. But Zach does not engage the issue in this way. He is tender and pastoral with those who are in this season precisely because he has been there himself. For those in the midst of deconstruction Zach’s words are refreshing and not agitating. As I read the book keeping in mind my own frustrations with the church, I never felt burdened or guilty from Zach's words. Instead he spoke of the wilderness journey that I have both written about and advocated. He spoke of the dark night of the soul, and in finding a way back into faith. See Zach has been there but also believes that deconstruction does not have to be demolition. There is a way back into a robust and honest faith. It is the kind of faith that does not rest on clichés and is not driven by guilt and burden. It is the kind of faith I so wish everyone could walk into and experience. And I think Zach knows the way. There were times in my life when I sing a different song — in the thick of my controlling charismatic upbringing, or while visiting a health and wealth mega church, or during my life saving but misguided New Calvinist phase. Or alongside our beautiful, but temporary and illusory, church plant. They were times when I sang a song of unabashed worship. During those times, I often found myself lost, detached from the crowd, devoid of self-consciousness, immersed in connection with Jesus. I raised my hands toward heaven without caring how it looked; I cried tears of conviction and joy and recommitment and gratitude regardless of how silly I felt. Sometimes I shouted “Yes!” for sheer joy, and other times I whispered “I’m sorry” in deep pain. And in all those times, I found the unspoken brokenness of my life, so overwhelming so much of the time, so devastating and its effects both within me and around me, repeatedly met somehow with an acceptance and assurance and a belovedness and peace that I cannot naturally explain. When I went through my very own apocalypse and my life fell apart piece by piece, it was neither a vague spirituality nor an empty religious ritual that pulled me through. Even in the midst of such a dead and dry desert of the real, there was always one thing, and one thing only that I held onto. That for my whole life I have been fiercely, unstoppably drawn to Jesus. And that when I look at him, I cannot look away. Only he can resurrect me. Where else would I go? What other song would I sing?